Change you can believe in. I’ve wondered often why the assumption of a large Climate Science™ body is so against warmer weather. As many here are noting, I do understand that CO2 will absolutely warm the planet. Still I am more skeptical than many as to whether that warming attributed to CO2 has been, or even can be, detected. Attribution studies are woefully inadequate and not due to inept scientists as much as the difficulty of the problem. The fact that some are even published is due to ineptness though as I have finished papers thinking the answer is – we don’t really know – but you can guess that that isn’t what was written. Being a multicellular air breathing organism, I like warm. I do also like polar bears but my guess is that they don’t mind warm either. We are only talking about a few degrees and that is NOT enough to end sea ice. We know for a fact that there are endless positive effects of a warmer planet and have only been able to come up with a few negative ones. The positive includes more plants, more area for animals to graze, more water in the air, less clothing on beaches etc.. Negatives, as written, are unproven. For instance, the melting of the ice caps. 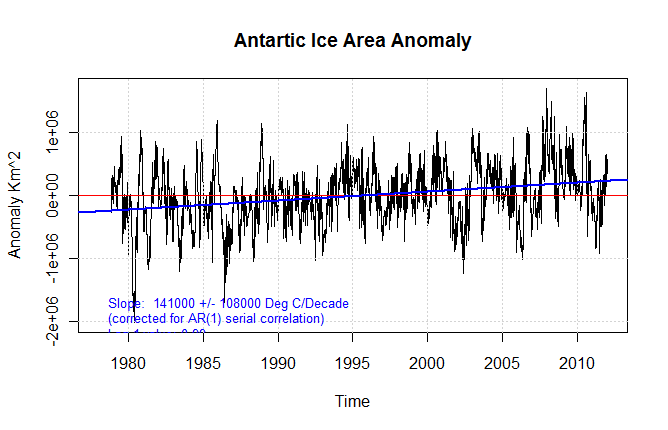 We have seen some summer ice shrinkage in the Arctic and some growth in the Antarctic. We have also seen that the caps refreeze every year with an abruptness corresponding to the very cold temperatures of the poles. Shocker!! Not a few C below freezing but several tens of degrees. I frankly don’t see the planetary doom in that. Antarctic ice isn’t melting any time soon and glaciers aren’t vanishing as advertised. We all know that this isn’t the story the media and scientists are selling but it IS reality. So what is really wrong with being warmer? What if we do see those temp increases the government organized IPCC predicts? I don’t really understand people’s incredible ability to react to unproven scenarios of destruction, simply because the scenario was stated. Shut off the power because we are worrying about an unproven ‘end of the world’ claim makes as much sense as not eating so we can save ourselves from heart disease. The world isn’t this clean pristine operating room environment which must be left undisturbed. It is a home in which we live and should care for, but that doesn’t mean we have to try and hold its weather static. The Earth doesn’t hold it static itself anyway. It prefers being colder and that is really bad news for us and I would also guess, the polar bears. I have reworked my sea ice code to account for leap years and to make it easier to read. It wasn’t a terribly easy process but it was useful. Here I will present some plots of sea ice trend as derived from the gridded satellite data. The purpose of this was to verify their accuracy and lay groundwork for future posts on sea ice. 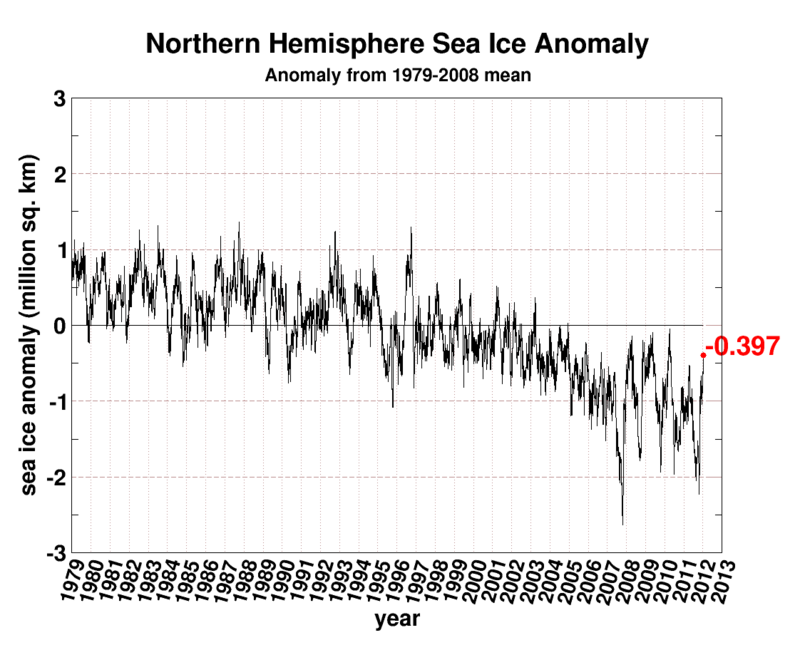 Unfortunate statistically significant growth of ice during unprecedented death-spiral sea ice doom. I’ve been spending time working on improved sea ice code. Anthony Watts asked for something and Steve McIntyre helped find the right R function to get it going. I want to also overlay SST data as well as flow direction in the videos. Hopefully it will lead us to some statistical analysis. In the meantime JWL has been discussing backradiation on the previous thread. It is an old argument which doesn’t have a lot of entertainment value for some of us. He has put together a pdf which alleges to prove that backradiation (radiation from cold to hot) is impossible in the climate system and has made the claim that nobody has critiqued his math. I’m going to help him out. A guest post by Dr. Weinstein in response to a post by Dr. Spencer. 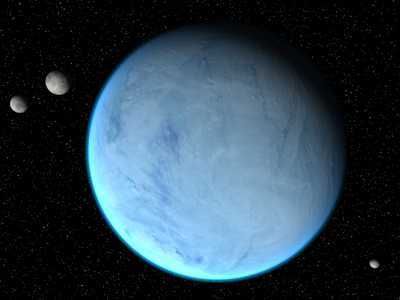 The issue has been raised about the effect of the mass of an atmosphere on surface temperature. It can be shown that if no optically absorbing gases, aerosols, or clouds are present in the atmosphere, that the average surface temperature will be determined by albedo, absorbed surface solar radiation (ignoring small radioactive heating effects), and outgoing thermal radiation at the ground level, and I will not discuss that issue here. The present discussion only considers an atmosphere with greenhouse gases, and for simplicity only looks at the effect of CO2 as a greenhouse gas. Only long time average global average values of temperature are considered, and only at long term constant CO2 levels (i.e., transient responses are ignored). Some simplifications are made here, as the complete analysis is complex, and requires accurate experimentally measured data values and assumptions that are not well settled. The main simplification I make is the ground temperature sensitivity of the Earth atmosphere to increases in atmospheric CO2 levels. Values from less than 0.5 C/doubling to over 4 C/doubling have been suggested as the result of CO2 increase plus all feedback effects, However I am only describing the CO2 effect independently here, and this has been shown in most studies to give a surface increase of about 1.2 C/doubling of CO2, ignoring all other effects. I use here is a mean virtual temperature, Tv~250 K that is based on an average temperature between sea level and approximate average location of outgoing radiation to space. This is an approximation, but its exact value has little effect on the comparison shown later. In addition, I use the wet lapse rate (as found in our lower to mid Troposphere) of -6.5 C per km height, even though I ignored the feedback effect of water vapor and clouds in the atmosphere to simplify the analysis. The value of H, which differs somewhat for different lapse rates, is called the scale height, and is the height where the pressure decreases by a factor of 1/e. I am using here the value of H ~29.3Tv for Earth’s atmosphere (based on the actual measured average atmospheric gas properties and Earth’s gravity), so combining this with the value of Tv selectedgives H~7.33 km. Changes in this value would be small enough for different assumptions that it would not change the basic result shown here. The case of a surface pressure of 1 bar (Earth’s actual value), with present amounts of CO2 (390 ppm), and with the effect of other greenhouse gases, aerosols, or clouds having a constant effect that is independent of atmospheric mass or changes in CO2, and assuming the same albedo as at present. The case of 2 bars surface pressure, with the same total amount of CO2 as case 1, but with an added equal amount of a mix of N2 and or O2, so that the average specific heat and molecular weight of the atmospheric gases are the same for 1 and 2. The greenhouse heating effect of other greenhouse gases, clouds, and aerosols are considered to be exactly the same as case 1 to separately show the effect of CO2 alone, and the albedo is still the same as in case 1. The total effect of the present amount of CO2 alone on an increase in temperature above the no-greenhouse gas for case 1 is not accurately established, with estimates for CO2 alone from 5 C to 15 C as compared to the 33 C estimated total greenhouse effect with all gases, clouds, and aerosols. Since some of the CO2 absorption and radiation wavelengths overlap some of the water vapor wavelengths, the effect of CO2 in the presence of water vapor is even less addition than if considered alone. I am examining the effect of only CO2 here. I use an estimated value of the total CO2 effect of 10 C for the present amount as being reasonable (the exact amount is not important as long as is significantly larger than the effect of one doubling). If case 1 has the same mass atmosphere as the present atmosphere, except the concentration of CO2 was 0.5 times that of the present (195 ppm), this would have resulted in a reduction of surface temperature of 1.2 C for the lower concentration, ignoring feedback. Case two does has half the concentration of case 1, but also has twice the atmospheric mass, so the total mass of CO2 is the same for both case 1 and 2, and the only difference is atmospheric mass (and corresponding thickness) of the total atmosphere. The question is: what does this do to surface temperature? The atmosphere is considerably thicker for case 2 than case 1 due to having twice the mass of gases, and this raises the altitude of some of the (assumed well mixed) CO2 a considerable amount. A simple analogy to see the effect is that if a thin unmixed layer of CO2 containing all the present CO2 mass in the present atmosphere were forced to lie close over the surface, and most of the atmosphere above it had none, the greenhouse gas effect would only raise the location of outgoing radiation a short distance above the surface. Multiplying the average outgoing altitude by the lapse rate would result in surface temperature increasing only a fraction of the 10 C presently possible for mixed atmospheric CO2. While the gases would mix eventually up into the atmosphere, this point shows the effect of altitude of the greenhouse gas as also being a factor. The equation for the relation between pressure and height for p1/p2=2 gives a value of (Z2-Z1)=5.08 km. Thus the pressure at 5.08 km for case 2 matches the surface pressure for case 1. The fact that a 0.5 change in CO2 would only change surface temperature 1.2 C implies that it only changes the average location of outgoing radiation by 1.2/6.5= 0.18 km if that were the only factor considered. However, the total change of 10 C possible for all of the CO2 alone implies the average altitude of outgoing radiation to space for all the CO2 alone was about 10/6.5=1.54 km. This is nearly an order of magnitude larger than the change due to a 0.5 change of CO2 (i.e., it is the result of the exponential response). We thus have case 2 with only 0.5 the CO2as case 1 in the lower 5.08 km of atmosphere, but where it has the same total mass of the entire case 1 atmosphere. However, we have on top of that, additional atmosphere with the same total mass of atmosphere as all of case 1, and also with 0.5 the CO2 as all of case 1. This upper layer would be as thick as the entire present case 1 atmosphere. If the upper layer absorbed and radiate all portions of wavelengths absorbed and radiated in the lower 5.08 km, this upper portion alone would have a location (for CO2 alone) 1.36 km above the 5.08 km level where outgoing radiation occurred. The actual solution of the resulting average altitude would require a full radiation analysis, and is not as high as that oversimplified version. However, it is clear that a thicker atmosphere, even without increasing total greenhouse gases over the thinner case, would have increased surface temperature due to the increased average altitude of outgoing radiation. It is also true that it is not the mass or pressure of the atmosphere alone that causes the increase, it is the combination of average altitude of outgoing radiation and lapse rate, and the increase in mass of atmosphere would raise the average location of outgoing radiation by virtue of thickening the total atmosphere. The final increase in surface temperature is the product of average outgoing altitude (including from the ground, greenhouse gases, clouds and aerosols), and lapse rate. Tom Fuller has started blogging again. He used to post at the SF examiner – until he also quit. Many of you will remember that he and I hold different views on politics but I find him honest and a far better writer than me. According to his email, his new blog will focus on energy and climate and appears to be directed at renewable energy. I’m looking forward to his contributions again and expect he will create a comfortable blogging atmosphere where difficult yet reasoned discussions can be held. Let this be a lesson to new bloggers, it is a trap! Tom’s blog (3000quads.com) is here and linked on the right. Below is the full length of the NSIDC SEA ice data. From 2.8 gb of data. The graphs of the Arctic and Antarctic are plotted on equal grid scales having a pixel resolution of 25km. The satellite ice data comes from the NSIDC Sea Ice Concentrations as collected from the Nimbus-7 SMMR and DMSP SSM/I Passive Microwave systems. UPDATE: High speed video from 2004 to present added below. In response to recent discussions, I’ve taken the time to download the 2.8 gb of data required to plot sea ice. I found a far better software for video creation called virtual dub. And I rescaled the graphs so that the Arctic and Antarctic are plotted on equal grid scales. The pixel resolution is 25km and the satellite ice data comes from the NSIDC Sea Ice Concentrations as collected from the Nimbus-7 SMMR and DMSP SSM/I Passive Microwave systems. This version represents just a few years of the total dataset and is similar to my previous publicaitons. You may note the higher resolution and frame rate than my previous work. Currently, I’m compiling the complete video for publication tomorrow. The purpose of the project is to first visually see if 2009 – 2011 which is not shown here, has similar weather patterns to 2007. Also, I hope to add sea surface temperature and flow directions to the video – both of which will probably add to our understanding of the sea ice situation. If I’m lucky, there may be some stats to follow as well. S0 I’m actually getting to where I feel better about things and have begun looking at actual data. Then I ran across this. It is a call to action to limit black carbon emissions, a far more sensible thing to attack than CO2, but the article is so insane that I simply refuse to accept that anyone in the world believes it has any attachment to reality. You have got to be completely insane to imagine that a 0.5C warming or the associated pollution will kill a minimum of 700,000 people per year. This is what passes for peer review?! There is simply no shame in these people’s makeup. Have you ever witnessed such incredibly blatant and false scare tactics? This actually went into a journal.Perhaps if this is the standard for the AAAS science magazine, it should rename itself Charmin. Steve McIntyre has an interesting post on how certain members of the most controversial sections of Climate Science™ have influenced the openness and transparency of the IPCC. As usual, he has put considerable time into the effort and discovered a unique chain of events in the public documentation. We wouldn’t want anyone pointing out that flawed Steig work was being used as a poster boy for global warming until after it was too late right? After all, Soon and Baliunas needed to go because its method was flawed, not because it was an anti-AGW result. I’m sure that the Berkeley temperature study will also be treated similarly. Sea ice is above average. 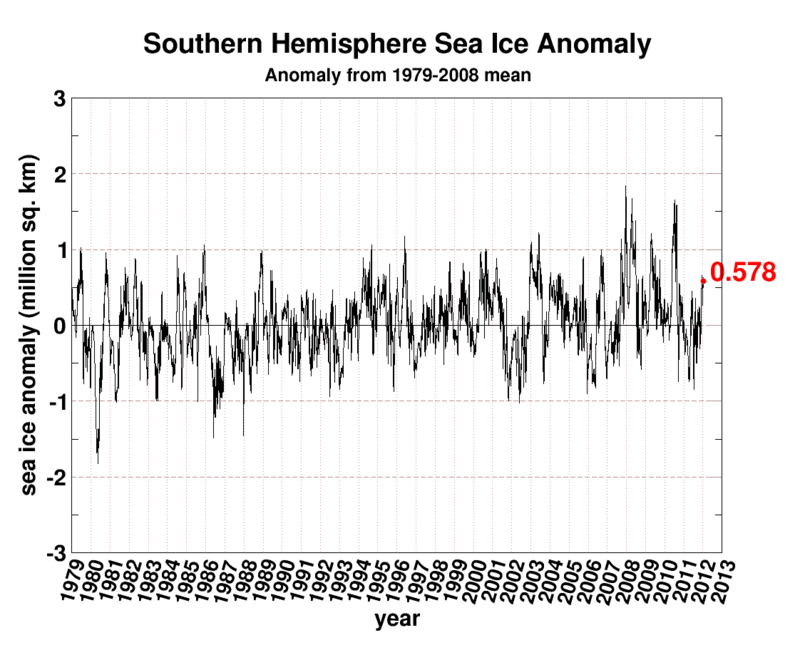 Despite my belief in CO2 global warming’s effect, I really don’t believe it has had any scientifically discernible impact on sea ice. Nutin!! Now we still believe ice does melt from warmth, at least I don’t think Climate Science™ has changed that yet (apparently thermometers still have branches), but you need a lot more than a few degrees to melt an Earth pole. The same Sun hating environment that makes Star Wars planet Hoth look like a friendly beach resort. I’m thinking that after I turn in the useless tax-payer sucking 501C we’ve been discusssing, to no useful effect, I’m going to write a letter to god and turn in the planetary poles for not listening to the government. God put us on Earth for a reason, and if Earth doesn’t realize it we ought to do something about it. Yup, still in a funk…. Some wonder why I’m tired and grumpy about climate blogging. Wikipedia is a great example. No matter the evidence, they will publish whatever revisionist truth compliments the leftist message. I will never contribute to that group although it could have been a wonderful source, it has become a biased propaganda engine of massive size. They are regularly asking people for contributions at a time when other websites of that size are rife with cash. Gee, does that sound like any newspapers you know? Media groups never seem to recognize that it is the message that is not selling, they always blame something else. Wiki claims that they don’t want adds to influence their content, but a few minutes of review by an unbiased individual reveals that the plain ain’t working. Today at WUWT, James Padgett has a nice post on the Wikirevisionist article on the Soon and Baliunas incident. The same SB paper which led to some insane behavior by the paleoclimatologist community which didn’t like the critique of their blatantly unreasonable methodologies. I’ve been so frustrated with the constant untruths in media and climate science that it is hard to post anything. Last night I spent a few hours quietly looking back at Ljungqvist 2010 proxies and will likely have a post in the next day or two on that. It seems somewhat removed from the out-of-control political idiocy disguised as science. Numbers are calming. Anyway, check this out. It is worth a read. As many readers are aware, the culture surrounding the climate change topic area of Wikipedia has been a microcosm of climate science for nearly a full decade. When you read the Climategate emails and see discussions of finding people to investigate and discredit your ideological opponents – that is Wikipedia. When you read about the IPCC’s usage of the WWF and students in composing their Climate Bible (KJV) – that is Wikipedia. When you read about “climate scientists” conspiring to get other scientists fired for challenging the orthodoxy – that is Wikipedia. In short, Wikipedia does not care about truth, and certainly not doubts, it cares about message. Read the rest at WUWT. In continuation of my investigation of the actions of the tax exempt 501c corporation the “PACIFIC INSTITUTE FOR STUDIES IN DEVELOPMENT, ENVIRONMENT, AND SECURITY”, I have dug deeper into the tax reporting and operations of Peter Gleick. It appears that this organization operates completely above IRS law, employing what appears to be 95% government taxpayer money for the purpose of actively campaigning against conservative politicians and organizations. It is by no means the only group to do so but we have to start somewhere. Gleick is an extremist political activist by any form of the definition you care to propose. He’s written numerous left wing propaganda pieces on the ‘green’ blog which are so full of pro-leftist disinformation that communist countries probably look to him for his expertise. Now there is nothing inherently wrong with an organization promoting untruths for a political goal, the 501c’s are a leftist heaven for such things. There are also conservative versions, but far, far fewer of them. Conservatives don’t believe in taking government money for these things. The result though has been a huge imbalance in funding for truth in science rather than the pro-government, pro-AGW, type messages. Thus, it seems reasonable that we should shine a little light on them here. In short, the choice among the Republican candidates on the issue of climate change is scientific ignorance, distain for science, blatant misrepresentation of facts, or naked political expediency, any one of which would make the Republican candidates strong contenders for the 2011 Climate B.S. Award. Combined? They win hands down. The worst part of the above for my heart, is listing Activist Joe Romm as an honest broker of science. The guy doesn’t have a scientific cell left in his body. They have all atrophied to raisins under his need to be green no matter the evidence. Seriously though, 501C’s are specifically prohibited from participation for or against any politician. This violation of their tax free status cannot be tolerated but we have to report it and then it is up to the IRS to determine whether they should be properly prosecuted. Steve McIntyre took the time to see how the PIS group filed last year and noted the boxes indicating that the group had not campaigned for any candidate in 2010. The above quote is from an article dated1/5/2012 so is the tax exempt group ok until 2013 when they will undoubtedly declare they are tax exempt for 2012? What puts a 501(c)(3) status in jeopardy? • Having excessive unrelated business income (UBI). Joe Romm may want to read up on these. The phrase ‘Substantial part of the activities’ for propaganda has become a huge hole in the legislation as that means some fraction of the tax free money can be used for propaganda. Where Gleick (and many others) go wrong is when they list the names of candidates discussing their policies while using our money. Ok, I’m tired again so rather than break down the tax forms from the PIS institute today, I’ll simply link the information here. Pacific_Institute_990_tax_10.The PIS group has received over two million USD, primarily from government sources over the last 5 years. This is equivalent to a healthy 10 million dollar company for profits while employing far fewer people for the result. The two million used by this group in tax represents the full taxation of a healthy 25 million dollar company in the United States. What also stinks is that all he had to do was build something with the employment level of a couple of gas stations and the guaranteed income of taxpayer money. Note that in section 4 of his corporate tax return, Gleick asserted to the IRS that his group has participated in NO political campaign activities. Will the lies about non-political status hold water in their 2011 return? Considering that the group has turned over 1o million dollars in profits/contributions (mostly government tax money) in the past 5 years, I think they will take their chances! Brazen Tax Exempt Pacific Action Committee Directly Violates IRS Code During Presidential Campaign! The Earth’s climate continued to change during 2011 – a year in which unprecedented combinations of extreme weather events killed people and damaged property around the world. The scientific evidence for the accelerating human influence on climate further strengthened, as it has for decades now. The only time that I know of where climate didn’t change was when Michael Mann invented it. Of course that lack of change is the point of the hockey shtick handle but we will beat that slow-witted monkey on the head some other time. What makes this stink to high heaven is that this PAC is not a political action committee. It is rather, one of thousands of left wing 501c money funnels which operate tax free while simultaneously pushing a pro-government control high taxation agenda. After the last US presidential election, thinking people should not be surprised to see yet another violation of the law ignored by the liberal activists. What stinks is the lack of astonishment in the media. Why is it acceptable for an obviously political organization to take literally millions in funding from government donors for the purpose of promoting extremist, left-wing, anti-capitalist propaganda? The PAC group had $581,000 USD in donations in 2010 ALONE!-after tax. What percentage came from taxpayers? It is absolutely sickening to understand that 66% ( $384,466 USD. ) of the revenues of this blatantly political organization are taken at literal gunpoint from American taxpayers. The money is being DIRECTLY spent for political propaganda in a campaign year! The ‘bosses’ work for this group part time of course, lining their pockets with a couple hundred K of candy while simultaneously working other committees. After all, the board of directors must be paid. It is hard to have any emotion about climate these days. It is like I’ve reached the end of the road and can see over the edge of the cliff. All is in view as far as you can see. They call it green but after Climategate 2.0, all I see is brown. Pound on more Mannian style math or random proxies, sure -can do, but why? Beat up on a little more Berkeley surface temperature studies, sure, can do. The data dicing is fantastic low hanging fodder. Again, why? Even Judith Curry has not responded to me on the simpler topic of CI. Not even a sentence. What is the point of wasting my limited time on these adventures if the geniuses won’t listen to reason. Beat up on the IPCC for reposting extremist crap? Sure, again easy fodder. How about “renewable” energy – the big anti-entropy lie. Fun stuff, but again why? Tough times for a technical climate blogger. 😉 Lots of the same crap, trees ain’t thermometers, ice ain’t melting, sea level ain’t rising from CO2, no more hurricanes, Antarctic and Arctic ice will still be there, on and on and on. Why not shut down industry!? Disaster Files – WG II “Impacts” zero order draft files released. A large set of from the AR5 IPCC zero order draft files was released at the Galloping Camel site. These represent working group II Impacts, Adaptation and Vulnerability chapters aka – disaster files. This section of the IPCC contains some of the most uncertain “work”, which for the survival of their unstated cause, absolutely must be overstated. These drafts typically get toned down, but not eliminated, through the reviews as reasonable heads make comments. Therefore the expected pattern is first those in charge say what they really think, then it gets chopped down over time, a little closer to what could be weakly defensible in a government court. Often in the past, obvious facts have been ignored. Correspondingly and unsurprisingly, this chapter is filled with some of the most extreme global warming conclusions possible in the eyes of a governmental organization operating in the wildly profitable industry of climate science™ alarmism. If you enjoy political propaganda, with a wealth redistribution twist, wrapped in a package only loosely disguised as science, then these are the files for you. Sea-level rise of more than one metre by the end of this century poses the single major threat to the coastal areas. More than 200 million people are already vulnerable to flooding by extreme sea levels worldwide and this population could be increased by a factor of 4 due to rising population and coastward migration, especially in Asia. New information is available on the likelihood of increased rates of ocean acidification. Although acidification is being addressed through international mitigation efforts, coastal policies need to address ocean acidification at the local and regional levels. More detailed and useful information would be required for the implementation of such policies. Here is a plot of sea level not rising at 1m/century. Perhaps Wikipedia’s conservative bias is preventing the proper sea level graphs from being posted.